Far away in western Ukraine, where mighty rivers flow through the green ravines, amidst the hills and dales of the Krementsky mountains of Old Volhynia (a region in western Ukraine) there lay an ancient stone with the footprint of the Virgin Mary herself. Upon that rock was built a stronghold, and a church atop it further still, wall upon wall, glacis upon glacis, arising from the viridescent hill. Today, Pochaev Monastery, a fortress of adamant, dominates the landscape like something from a Russian fairy tale. It is not possible to overstate its beauty; its cathedral complex is a colossus atop a great stone plateau rising from a walled hill. The countless phosphorus stars of heaven's fields are mirrored in the azure domes. Its ivory halls hold many a tome written in the ancient Slavic tongue. Its towers are tall, where bells are rung, calling people to argent Churches, where many a song of praise is sung. 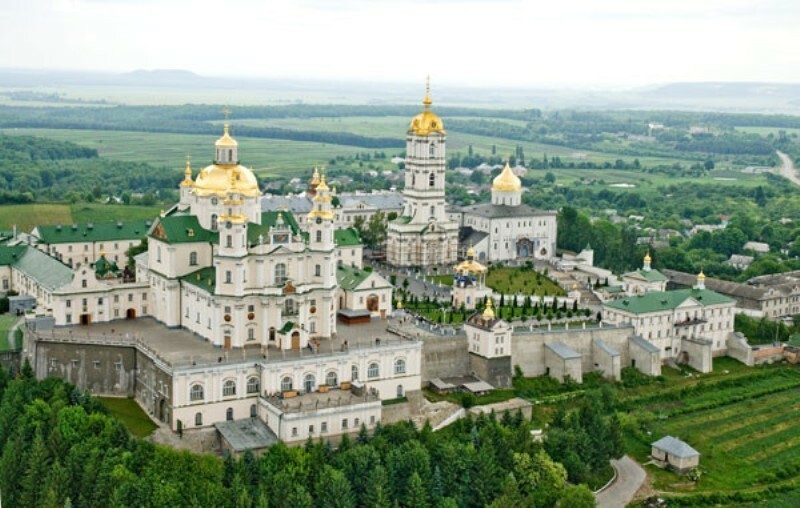 Its crowning jewel is a golden cathedral, overlooking the valley and village of Pochaev, remnants of old Kiev. Pochaev Lavra was founded in 1240 by monks fleeing the fall of Kiev, which had been captured by Batu Khan of the Mongol Horde. Settling high on the rocky, forested hills, the monks were honored with the apparition of the Mother of God Mary. The Ever-Virgin Mary appeared to them in a glorious crown and left the imprint of her foot upon a stone from which flowed a water spring. The villagers of Pochaev to this day consider this spring a sacred place of healing. The Altar of the main Cathedral. 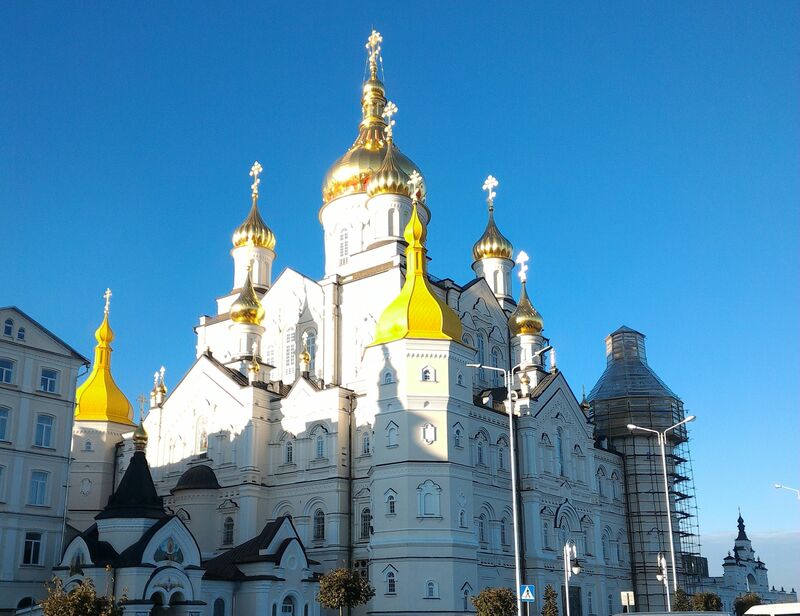 The modern historical era of Pochaev begins in the 16th century when the monastery received a gift of land from the local nobility and built the Dormition Cathedral atop its hill. 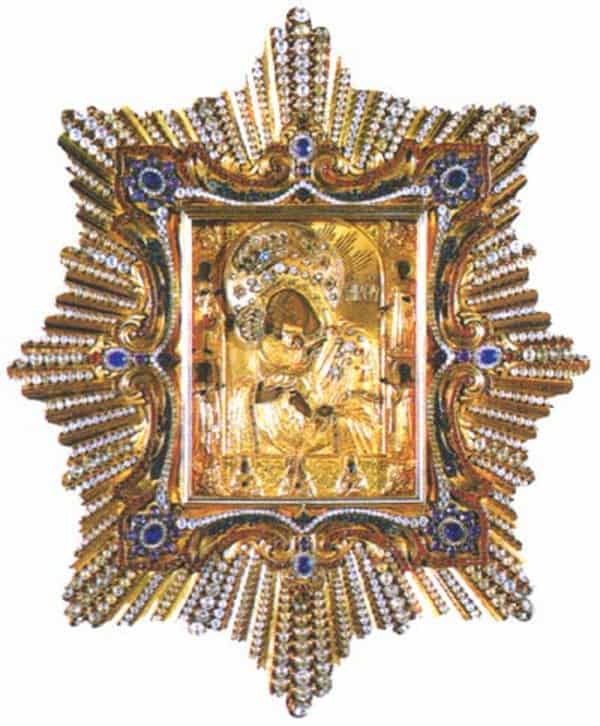 It was also in 1597 when then they received the monastery's most valuable treasure – the wonderworking Icon of the Mother of God from a local noblewoman Anna Goiska. Then-President Yanukovych of Ukraine venerates the Icon of Pochaev. In 1604, Saint Job of Pochaev, the monastery’s greatest leader, joined the brotherhood. 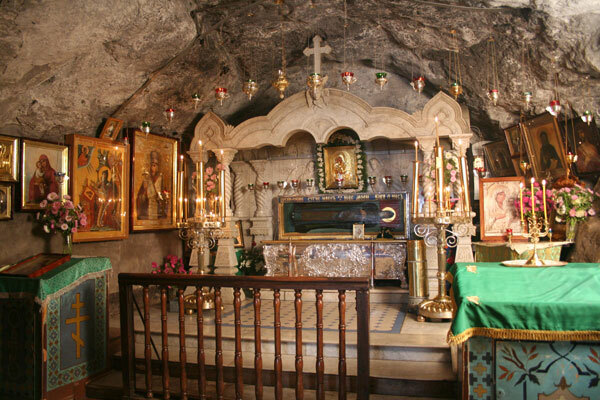 Saint Job is on the left, and an icon showing the founding of Pochaev in the 13th century is on the right. The Large church in the middle is Dormition Cathedral. He knew that it was the last stronghold of Orthodoxy in Western Rus’, which was then totally under Polish (and thus Catholic) rule. The Icon, Our Lady of Pochaev, is honored by Orthodox and Catholics alike after the Pope officially recognized it as miraculous at the end of the 18th century. Tales of its miracles have become a legend. When an invading Turkish army came to destroy the Lavra, the defenders prayed and the Mother of God appeared with an army of Angels and Saint Job over Pochaev Hill. Their “sorely incandescent” (bright and burning with light) faces terrified the jihadis, and they fled, and a great multitude of them accepted the Orthodox faith. Saint Job presided over the monastery’s best years when he constructed the church of the Holy Trinity over the stone where the Theotokos left her footprint. The most famous action of Saint Job, however, may be the printing press he helped establish. The press influenced all of Russia, Ukraine, Poland and eventually, by a strange twist of fate, ended up in Upstate New York. St. Job’s spiritual rule was during the days of the Union of Brest, a terrible traitorous treaty between local Orthodox hierarchs and the Pope. Politically, the move benefited some secular leaders, as the land was under Catholic rule, and it made them “fit in” better, with their overlords. However, the monasteries and ordinary people were virulently against the treaty, and felt horribly betrayed: They went to bed Orthodox and woke up labeled “Catholic”! It divided the land and people and caused the creation of the Greek Catholic Church in Ukraine; before, only the Orthodox church existed in Ukrainian lands. The Interior of Dormition Cathedral from the Choir. It was renovated during the period of Catholic rule. The union's partisans, called Uniates, sought to drive Russian Orthodoxy from its birthplace, replacing it with Catholicism. Their service, music, style, and architecture was the same, but they commemorate the Pope of Rome, and are not in union with Orthodox hierarchs nor do they pray for them. At the same time the Szlachta - Polish Nobility - of the Latin speaking Roman Rite, tried to ensure that Latin became the dominant liturgical language of the country, even though Old Church Slavonic, the language of Slavic Orthodox Churches, is closer to Polish than Latin. Despite being descendants of Old Slavonic peoples, Poles were servants of the Latin Pope. With Vatican influence oppressing the Slavic culture, it seemed like Slavonic was about to be lost forever. God intervened, however, and sent Saint Job and Orthodoxy a defender in the form of Prince Konstanty Wasyl Ostrogski, a Polish nobleman of Russian descent, and a firm enemy of the Union of Brest. Though loyal to the Crown of Poland, his heart could not bear the suffering of his Orthodox comrades, and he founded the Academy of Ostrogh, to strengthen the Orthodox cause and preserve old Rus’ culture. It became a fortress of Slavic academia which remains one of Ukraine's most prestigious universities. Ostrogski lent his support to Saint Job, and together with the famous Russian printer Ivan Fyodorov, they made the first Slavic Bible printed on a press, the Ostrogh Bible. Constantine Ostrogski on the monument of 1000 years of Russian History in Novgorod, Russia. This printing press lives on today when it was rescued and brought to Jordanville NY before it could be destroyed by the Bolsheviks, and the tradition of Saint Job is alive and well in Pochaev today. 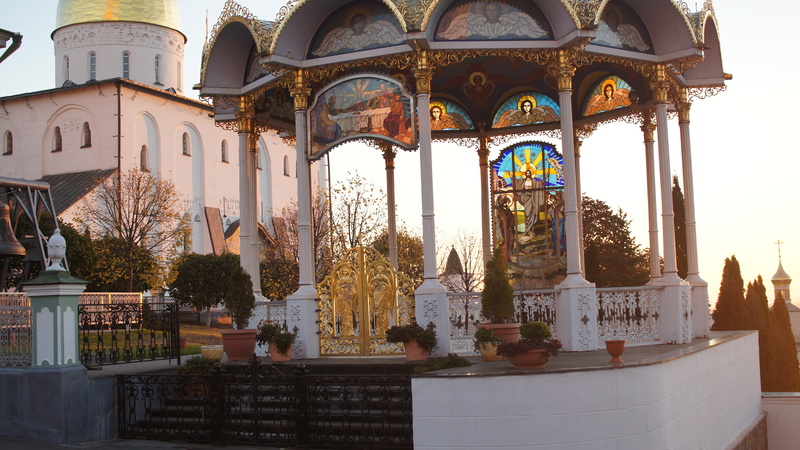 In 1713, the monastery was forcefully given to the Uniates (Catholics), but it was returned to the Russian Orthodox Church in 1831 by the Czar and today it functions as it did in the days of old. 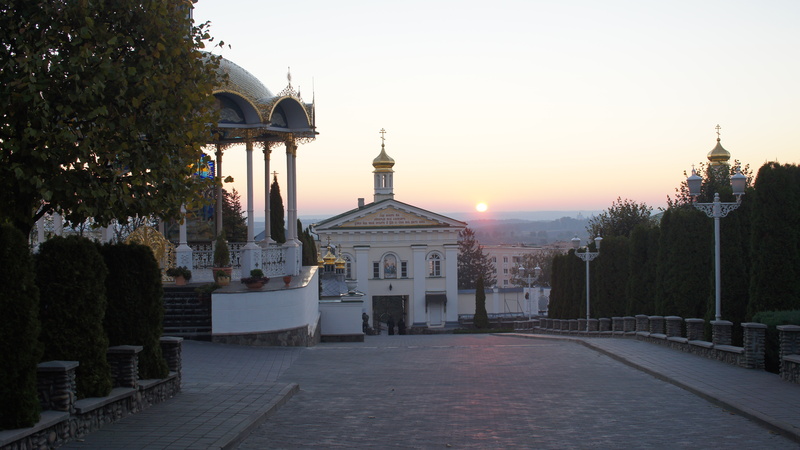 Pochaev has always been at the center of many storms and battles in Western Ukraine, but even as Turks and Catholic invaders try to conquer the monastery, it remains a fortress of Russian Orthodoxy shining into the western sun. 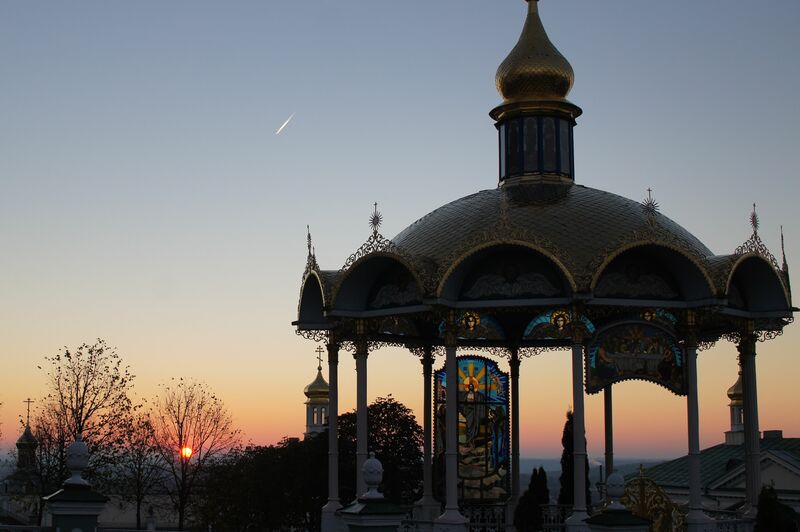 The fate of Pochaev Lavra and Western Ukraine are bound together, and reflect each other's condition. When the sun strikes the summer church, one can think they are in heaven. Today, Uniates still try unsuccessfully to steal the monastery from the Russian Church. With the Ukrainian Government’s post-Maidan habit of betraying its people, fair Pochaev may yet again be in danger. That may explain why it is still protected by an elite team of Cossack warriors to this hour, but that is a story for another day. A Shrine inside a tree. A view towards the main gate.